Attract guests to your menu selections with the clear visibility, easy to clean, Winco PMC-14K Single Black Menu Cover, 8-1/2" x 14" This menu cover with a single pocket enables your customers to view both sinner dimensions es of your menu on one double-sided page. 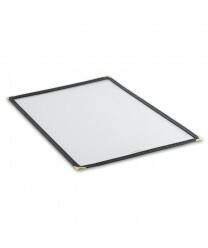 It has a simple black vinyl border with brass corners that gives it an instantly upscale look. This menu cover holds 8-1/2" x 14" paper allowing you to create and print your own menus and change them as often as needed, giving you the flexibility you need to change menu options, pricing and designs without incurring any printing costs.